Background: Parkinson’s disease (PD) is the second most common neurological disorder characterized by loss of dopaminergic fibers in the basal ganglia and presence of Lewy bodies. Method and Results: The literature suggests that caffeine plays multiple roles in PD. Epidemiological studies showed that caffeine intake was associated with less risk of developing PD, especially in genetically susceptible patients. On the level of Lewy bodies' formation, caffeine binds to α-synuclein protein inducing conformational changes and preventing their aggregation. On the level of mitochondrial stress, caffeine acts as an antioxidant that reduces oxidative stress in PD and therefore, slows the progression of the disease. On the level of dopamine release, the literature suggests that caffeine increases dopamine release and the number of dopamine receptors in the striatum via A2a receptor antagonism. Conclusion: As an adjuvant treatment, caffeine interacts with antiparkinsonian medications and can alter levodopa pharmacokinetics, reduce dyskinesia, and improve gait in patients with freezing of gait. 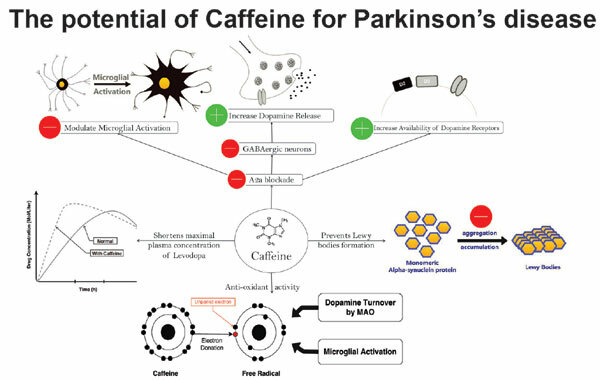 In this review, we discussed the potential of caffeine as a possible neuroprotective agent and as an addon therapy for PD. Keywords: Adenosine receptors, Caffeine, Dopamine, Lewy bodies, Parkinson&apos;s disease, tremors. Keywords:Adenosine receptors, Caffeine, Dopamine, Lewy bodies, Parkinson&apos;s disease, tremors. Abstract:Background: Parkinson’s disease (PD) is the second most common neurological disorder characterized by loss of dopaminergic fibers in the basal ganglia and presence of Lewy bodies.